You, Me and Movies: Will 2016 be the year of the Video Game Adaptation? 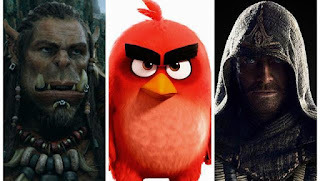 Will 2016 be the year of the Video Game Adaptation? Last year, I wrote a piece on the massive onslaught of spy films we experienced in that year. I think it was interesting to look back and see how history played out for itself. The year 2015 was a big year for the spy genre, that year we got all sorts of voices spilling into the genre, playing in its themes and concepts. Some failed, some succeeded and it made the year more colorful for it. This year could bring something new to the table. We have three video game adaptations coming out this year. The most I can recall in any year. The video game adaptation has been pretty dead in recent years. Possibly because its been so unsuccessful in years passed. "Super Mario Brothers," "Street Fighter," "Mortal Kombat," "Doom," these movies aren't just horrible, they were some of the worst drivel of their respected years. I could list off even more video game adaptations which were poor. When I tried to think of a video game adaptation I liked, I couldn't think of one. I kind of get it though, video games and movies couldn't be more different from one another. Movies are, by definition, passive. You sit in a theater, you watch the film play out, you decide whether or not you like it. You really don't have to do much work as a viewer. The video game is a much different experience, you are in the experience of it all yourself. Video games challenge how we work through puzzles, how we handle patterns, how we think, how we strategize and how we solve problems. Movies don't test us in any of these arenas, so adapting a video game to fit in that mold is difficult. Its been proven difficult. It also is apparently difficult to adapt a video game while keeping the essence of that game intact. Most video game adaptations feel like sleazy fan-fictions of games, not adaptations themselves. Plus, since so many movies rip off of movies in the first place, their adaptations feel like rip-offs on top of rip-offs. I am also stunned that so many video game adaptations aim so low. In 2016, with the trailers for "Warcraft," "Assassin's Creed" and even "Angry Birds." It seems the filmmakers are finally aiming high. They look to be making movies that both honors the fans of these games, as well as telling an engaging and entertaining story. I have played some "Assassin's Creed," and just watching some of the iconic movements that Michael Fassbender does makes me excited on its own. Plus, I don't think a single video game adaptations has had such high-profile actors as Fassbender and Marion Cotillard in the mix. As far as "Warcraft" is concerned, the film is being directed by Duncan Jones. Jones already has two great movies under his belt in the form of "Moon" and "Source Code." He's never made anything quite like "Warcraft," but that could be a good thing. But good artists attached to a movie is neither here nor there. What is really sparked my interest in these movies is how they seem to celebrate their iconography. I mentioned above how amazing Fassbender's movements are in the trailer. It feels like "Assassin's Creed." Watching the "Warcraft" trailer, it feels like Warcraft. Watching birds actually play the game in the movie itself has me curious about "Angry Birds." The people behind these movies seem to understand what makes these games special and what makes them work. I am curious to see how fans of these games feel about these trailers, because as far as I am concerned, they nail the iconography. There is a first time for everything. I wonder, will 2016 be the year where video game adaptations became more than "just" video game adaptations. Will this year be a watermark for the sub-genre? Or will they just because very expensive disappointments? Time will tell.